Audio is muted for the first part of the video, sadly. Card did look pretty real there. The flavor text on this card is pretty wild. Has a magic card ever referenced an earthly beverage before? Is the coffee grown in the city? Tell me that isn't coffee. The actual date is July 28. 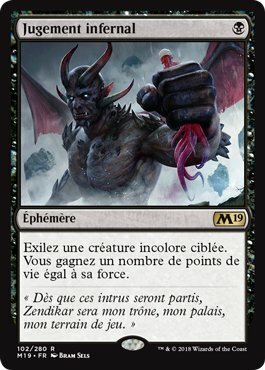 I want some copies of this in the sideboards of all my Grixis decks immediately. Every part of it is relevant -- incredibly mana-efficient; it hits both artifacts and Eldrazi; it exiles (nice Hangarback Walker over there); incidental lifegain. Any event is better than no event. And a large tournament of paper Vintage, with proxies allowed, has plenty of mystique. Your efforts are very appreciated @Prospero. I'd be very sad to see the NYSE be a thing of the past.